TeaWithBuzz | Buzz actually prefers water. I’ll have the tea, thanks! It is a good thing to see and do. It is a good idea to have a good view of the surrounding area. It is good to know the things you do not do. It is good to know the things you do not mind. I do not feel like it. I do not have a mind. So, if for some reason you are bored and staring at your computer or phone, maybe you will try this and see what you get. My husband G and I were having a problem. Neither one of us likes doing dishes. We had been taking turns cooking dinner (or deciding on a restaurant) and then not washing the pots and pans and cutting boards and sharp knives and other accoutrements of cooking. 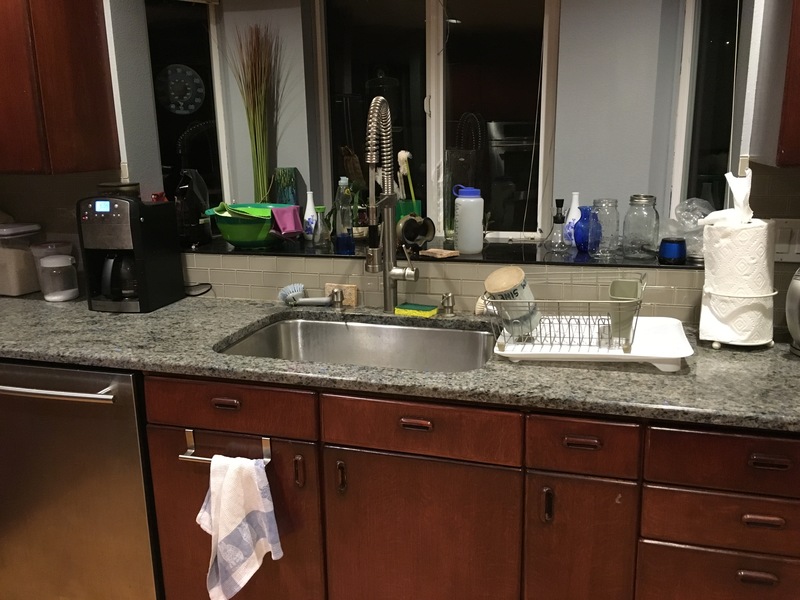 On the weekend, the dishes would get cleaned by the person who hated the pile of dirty dishes more. And that was not me. While I did not mind not doing dishes, G was getting more and more resentful of me not doing dishes. Which I can totally understand, but which was not a good motivator for me to do my share, especially since he rarely complained. But he did complain, eventually, which is a good thing. I apologized. The next day, I proposed an arrangement, inspired by a couple I had met when I was in college. I proposed that G cook all the dinners, and I would wash all the dishes, as my job. I think I got the better deal, even though I don’t like doing dishes. I love having someone cook for me every night! I love having someone else decide what to cook! I love smelling the cooking meal and wondering what it will be! I love not having to stop at the store on my way home at rush hour, or on weekends when the store is super crowded! G thinks he got the better deal, since he gets to try out even more new different recipes and he never has to do dishes. So far, after a week and a half, things are going great. I don’t wash the dishes every night, but I do them often enough. No piles of dirty dishes! G is happy that the pot or pan or knife or cutting board that he needs is clean, ready to use. I am happy to have my responsibility defined. Maybe this arrangement will last a long time. It will be interesting to see if we can keep it going. Thank goodness for digital media. You can see right away that your photos are terrible and delete them immediately. Back in the 80’s, we had film. My first camera was an Instamatic that took 110 cartridges. The viewfinder was to the side of the lens, and there was a place on top to attach a cartridge of flash bulbs. What a waste of plastic (I’m thinking of the flash bulb strips, but really the film cartridges were also a waste). Anyway, on my visit to my parents last week, my dad tried to get me to take a box of stuff back home with me. I took some letters and some photos, and left the rest to be mailed at a later date. Here are three photos from that box. They are from a family trip to Charleston, SC, and Savannah, GA. I don’t remember exactly what year that was, but I remember that in Charleston the tour guide joked that it was fitting that the yanks (us) were sitting in the back, and pointed out the doors painted “Haint blue” (it hai’n’t green, and it hai’n’t blue. Sort of a dark teal color.) I also remember that there was a problem with the first hotel room and we either changed rooms or maybe hotels. I remember that in Savannah we stayed in the Hyatt, which was much fancier than our usual motels, but my mom worked with Hyatt in Buffalo in her job in either advertising or PR (I don’t remember which it was at the time, she did both for the same company at one time or another) and got a deal or something, and we also got a wine and cheese platter as a surprise in the room. I think that trip marked my first experience at a Japanese restaurant, and I remember liking the “tofu soup” (miso). I am amazed looking at the photos that I saved, however. I must have saved them all. Some are incredibly blurry, and I still saved them. Some are completely unidentifiable, just darkness, or very very blurry people. A bunch have already going into my recycling box at home, like the photo of a nearly blank wall with a calendar open to October taking up about 1/8 of the frame. Also, the one that seems to be an empty board game box with STAY ALIVE in large letters printed on the inside (and possibly the instructions for the game) but the photo is overexposed and possibly double-exposed, so it is hard to tell. I think this photo is from 1983 or 1984. The “nobody in particular” probably means I did not actually know that kid’s name. He looks like he could be Douglas Welch, maybe. [2/22/16 Douglas Welch confirms that it is indeed him] Why did I want a photo of the library ladies at school? Why are the other kids in the photo at all? In fact, Woinam shows up in a surprising number of photos.Why? Here is a photo that was printed in May, 1980. I was 9 years old. I like this photo, but I have no idea where it was taken, or who it is. I have another sort of near photo of a person from that event, and several photos of some far away people from that date, one of whom might be Julie Huberman. There’s a blurry photo of a woman at the edge of a frame, as if she doesn’t want to be photographed. There is also one of some kids on some sort of parallel bar apparatus. What was that and why was it there? I do know that May of 1980 would have been nearly the end of 4th grade, and I was at Waterfront School, so this was probably some sort of class trip. But the rest is a mystery. Tickets to fly to Buffalo for Christmas were very expensive. So we decided to wait. February, that seems like a good time to travel. Round trip tickets were under $500/person, so I bought them. Red eye flight from Portland to Newark, and then a commuter flight from Newark to Buffalo at 9 am the next morning. Then, because the prospect of a red eye flight is never appealing, I upgraded those tickets to first class, by cashing in some frequent flyer miles and paying an extra $75/ticket. Maybe sleep would be more possible in first class than in coach? I was hoping. Our flight was due to leave at 11:04 PM, and I was monitoring the flight status from my phone when I went curling at 6 PM, planning to zip home at 8:00 after curling, change clothes, and drive to the airport. Time enough for a beer at the Rogue Brewery restaurant in PDX airport before getting on the flight. But there was a winter storm on the east coast, and our plane had yet to LEAVE Newark when I got to the curling club. After a series of delays, the plane was rescheduled to arrive in Newark after our commuter flight to Buffalo was scheduled to take off, so I left curling with the plan to spend some time on the phone with the airline rather than leave immediately for PDX to catch our (now) 1:45 AM flight. I called United and explained the situation, and Patricia (the nice representative) said the only Newark to Buffalo flight she could fit us on left at 5-something PM, giving us a 10-hour layover in Newark airport. I thought that did not sound like fun. So Patricia rescheduled us on a different airline, Delta, leaving at 6 am the next morning and connecting through JFK instead of Newark. That sounds great, I said, and she gave me a new confirmation code for Delta. Great! I opened the Delta website to check in, and input the confirmation code. The PDX to JFK flight was cancelled. Yikes! I called United back on my cell phone, but the recording told me the wait time to talk to a person was 20 minutes. I left the line open and grabbed our land-line phone to call Delta, where I talked to a person much faster. The young man at Delta was also very helpful, though his information told him it was the JFK to Buffalo flight that was cancelled, probably due to the record snowfall in Buffalo at the time. Most snowfall recorded on February 16th in Buffalo, not a record in general. [note – my mom reported winter aconite coming up in her garden just a couple days earlier.] So he was trying to find us a new flight. In the meantime I was still on the Delta website, but I was maddeningly unable to click on any buttons, including the “select alternate flight” button. I did not realize that my cell phone was pressing the Control key at the corner of my keyboard. Agh! Suddenly, the Delta rep’s information changed. He asked me if I did something, and I hadn’t. We were magically rebooked (and checked in) without him or me doing anything. Now we had a 6:05 AM flight from PDX to Seattle, a three-hour layover, a flight from Seattle to Atlanta, another 3-hour layover, and a flight from Atlanta to Buffalo, arriving at 11:04 PM in Buffalo, only about 24 hours from my first phone call to United and only about 12 hours later than our original plans. AND, because I had upgraded that PDX to Newark flight…we would be going first class all the way! OK, so instead of gearing up to drive to the airport, we had to sleep with plans to wake up in time to drive to the airport at a little before 4 AM. Fine. I had a glass of port and went to bed. We got ourselves to the airport the next morning, got a caffeinated beverage each, were seated on our first flight in good order, and requested orange juice. Comfy seats, pillow and blanket, free beverages! And we sat there as everyone boarded, and we taxied away from the gate…and then we taxied back to the gate, because there was a mechanical issue and couldn’t take off. Sigh. Well, it wasn’t too bad, since we had the long layover in Seattle, and the mechanic switched a backup system into place and we took off with only an hour’s delay. We enjoyed a big breakfast in Sea-Tac airport, then took the tram to terminal S to await our next leg. I explored the bookstore, and laughed about the woman complaining that neither of the only two brands of water sold in the bookstore was spring water. Our flight to Atlanta was on a large plane, with the kind of first class seats that have buttons to raise the leg rest to flat and a little reading light, and a personal entertainment screen. Swanky. We were served a calzone lunch with salad and dessert and cheese, and I used the entertainment system to listen to the Broadway cast recording of Hamilton. I raised my footrest, leaned back, and relaxed. Then the flight attendant stopped by to explain that the hand-washing water in the first class bathrooms had flooded the front galley, and he was putting bottled water in the bathrooms for hand washing. Huh. On arrival in Atlanta, we heard an announcement to be very careful exiting the plane, as they had to exit us THROUGH the front galley, and it was very slippery. As we got up and waited to exit, we could see that they had used some sort of absorbent powder on the floor to help sop up the water. This powder what what had made the floor slippery. Our flight attendant was dressed in paper booties and a plastic smock over his uniform. The pilot came out of the cockpit and asked about the mess. We overheard the conversation in which someone worried that it was unsafe for passengers to exit the plane. Happily, that argument was denied and we were allowed to exit, while being told to be very careful! We arrived in Atlanta’s terminal E, but our next flight took off from terminal B, so we walked through the underground tunnel to get some exercise and checked out the eateries available because I wanted a beer. We settled in TGI Friday’s for beer and a snack, and wandered to our gate, B16. Which didn’t have our plane at it. We’d been moved to the far end of terminal B, no problem, we went there, and everything seemed on schedule and fine. We boarded and settled down, expecting everything to be fine. Which everything was. All fine. We landed half an hour early in Buffalo and taxied across the snow-covered pavement to our gate. Well, the jetway was stuck and would not move. They tried, but the jetway would not budge. Eventually, they decided to tow the plane to a different gate. Yay! Then the towing pin on the plane-towing-cart broke and had to be replaced. A full hour after landing, we finally exited the plane, and found my parents as they were about to leave the airport thinking they had missed us. Whew. I don’t know how late we stayed up after getting home, talking and drinking mint tea or bourbon, but we slept until after 10 am Eastern time this morning. And it is snowing. 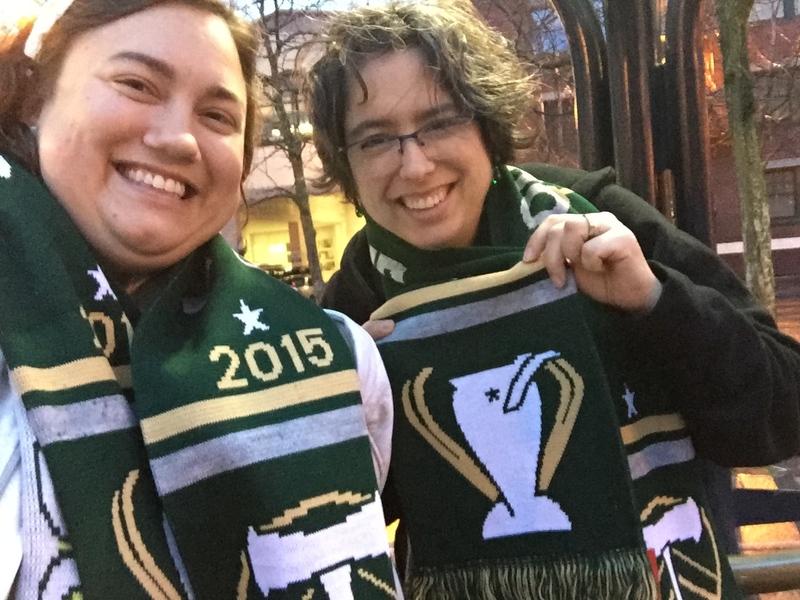 When I came to Portland in 2013 to interview at Vernier, Jackie took me to a Timbers game. She gave me a scarf to wear, and the Timbers won that night, with Diego Valeri making the winning goal. Jackie has season tickets to the Portland Timbers, in the General Admission section of the North End of the stadium, where the Timbers Army makes its home. There is only one of Jackie, and she is generous enough to let me buy her other ticket most of the time. So I have made it to most home games (missing a couple due to travel) this year. 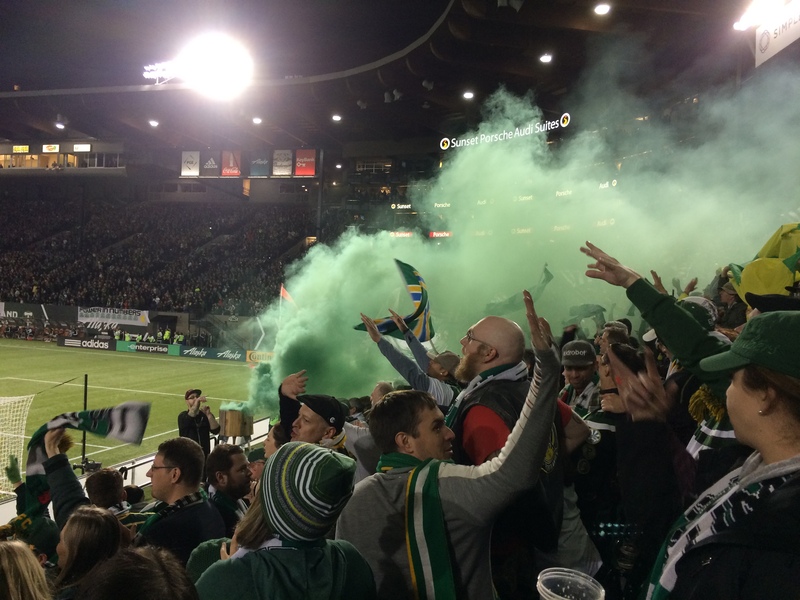 The year started out iffy for the Timbers. They struggled to be “above the red line” for most of the season. The red line refers to the line drawn between the top six teams in the Western division of Major League Soccer and the teams below, who will not play in the post-season. But being a Timbers fan is not a fair weather proposition. The Timbers Army loves the team, rain or shine, goals or no. Of course, there are many complaints if the goals don’t come, but we stick by our team! A massive photo shoot was held this year, the 5th year the Timbers played in MLS. 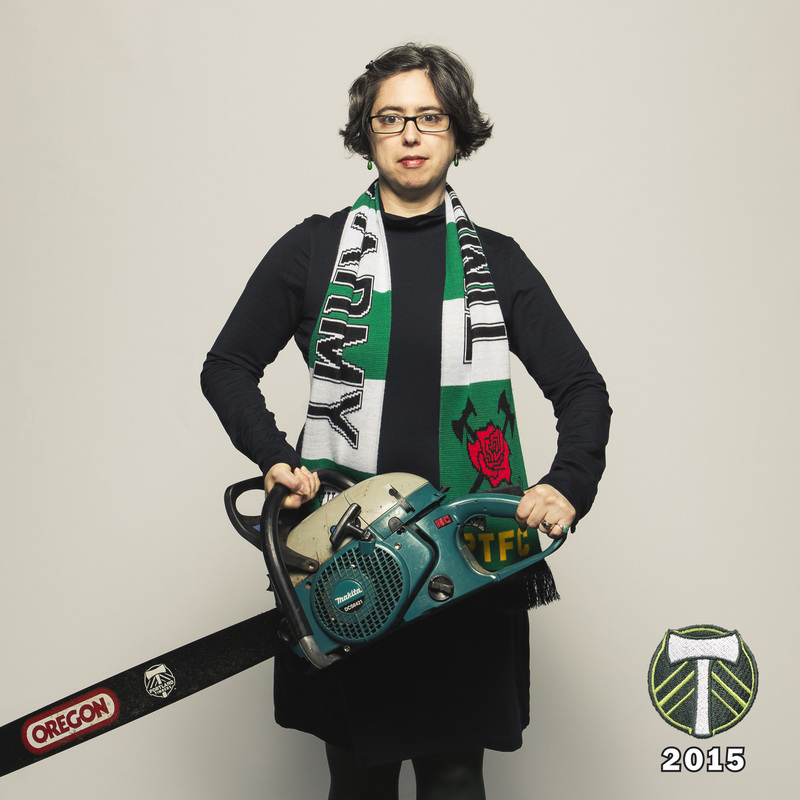 Any fan who got into line early enough got their photo taken with axe or chainsaw. But the end of the season was a different story. Head coach Caleb Porter changed up the starting lineup and the team’s formation on the field, putting striker Fanendo Adi up front, backed by Diego Valeri and Darlington Nagbe. The back line was anchored by Nat Borchers and Liam Ridgewell, who stopped many shots before they even made it to goalkeeper Adam Kwarasey. The Timbers inched up the rankings, and made the playoffs! 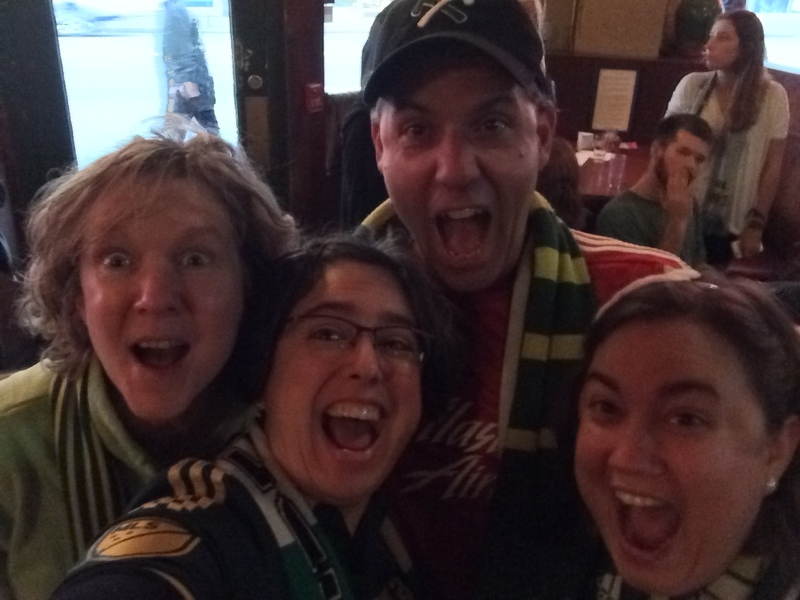 We are excited that the Timbers won the MLS Championship 2015! We each bought the official scarf to commemorate the event! The Timbers won on Sunday, December 6th. On Monday, the team traveled back to Portland and were greeted at the airport by a mob of fans. 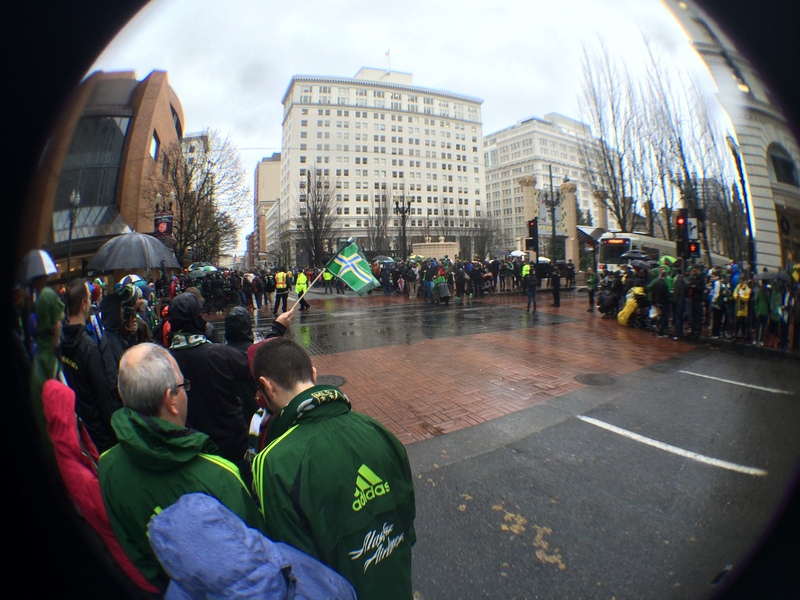 On Tuesday, fans thronged Broadway in Portland to see the team and the cup! I was one of many who left work at lunchtime to be there for the team. 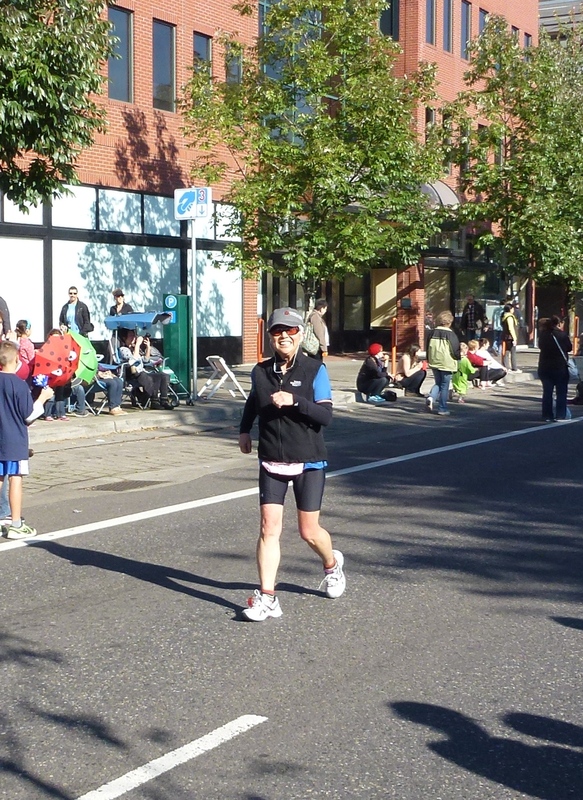 Lots of fans in downtown Portland! 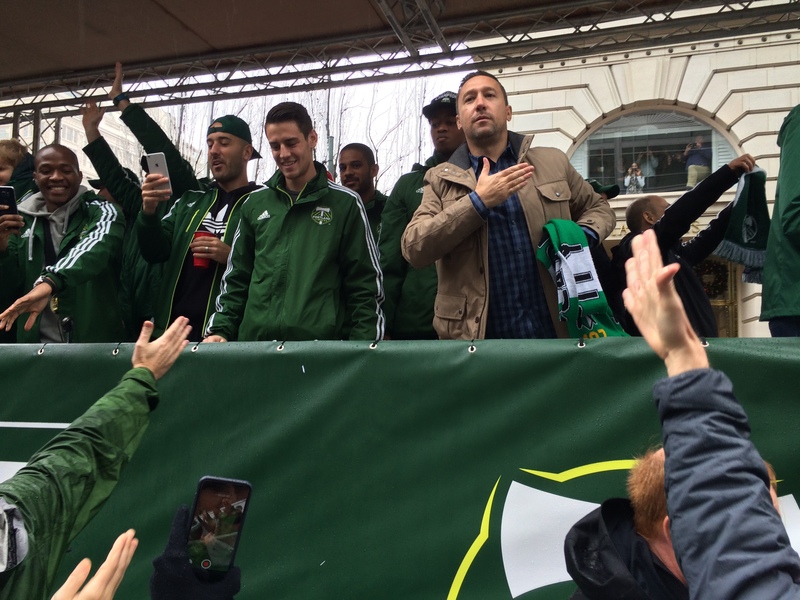 Head coach Caleb Porter expresses love for the Portland fans. Timbers players and fans are all getting photos of this occasion! I remember when the Phillies won the World Series in 2008. A lot of students and teachers ditched school to attend the parade in Philadelphia. I went to work, and covered half-empty classes for missing teachers. I was a little resentful. I was pleased to join this celebration for the Timbers, though! It was a lot of fun, in steady rain! Later that day, at about 6 PM, there was a rally in the stadium. Coffee, hot dogs, and cocoa were free, and the crowd chanted and sang. Timber Joey and his predecessor Timber Jim each cut a slice off the big log (which traveled by truck to Columbus and back) for the players who scored the goals in the final game: Diego Valeri (who scored within the first 30 seconds of the game) and Rodney Wallace. George Fochive taught the crowd a new chant, Liam Ridgewell dropped the F-bomb at least 6 times, and there were short speeches by the mayor of Portland Charlie Hales and the team owner Merritt Paulson. 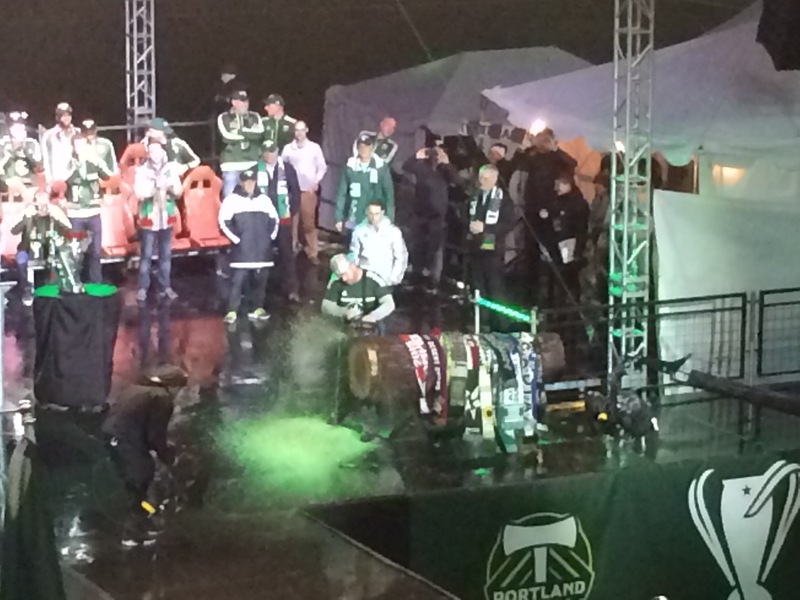 The team saluted the Timbers Army, and a good time was had by all in the wind and the rain! Soccer is over until Spring, and team rosters are changing. There is no knowing what the future brings. We hope it brings another MLS Cup to Portland! The title says it all. But I can also give you details. I love bicycling to and from work because I get to see things I would not see if driving a car. Today I saw a lot of birds, as usual, and I saw a snake (which I almost ran over, because from a distance I could not tell it was a snake), and Mount Hood. 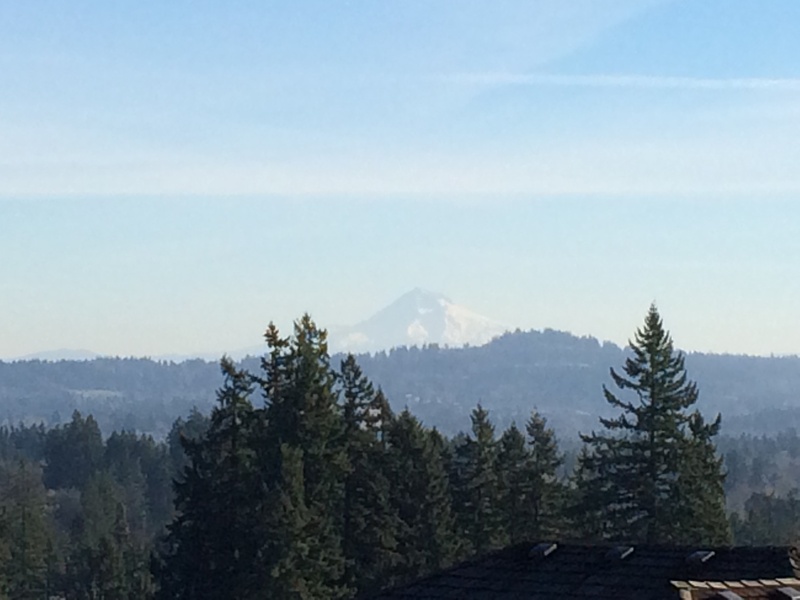 It is generally only possible to see Mount Hood on my commute while crossing Tualatin Valley Highway. If I cross that road while driving a car, I can’t also look at Mount Hood. On a bicycle, I can get in a glance. I like being out in the open, not surrounded by plastic and metal, and most of my commute is on a trail so I am not even in traffic. I like getting exercise. It makes me feel good to move. I hate bicycle commuting because of Mount Williams. It is not a mountain. It is a really big hill. And the last 130 vertical feet are the worst. I know that if I keep working at it, I will eventually be able to go up this hill with much less difficulty. But it is hard work. Also, I hate Millikan Way between the Nature Park and Murray Blvd. There is no bike lane on that stretch, and people always drive faster than the posted speed limit. Plus, there are curves. So I ride slowly on the sidewalk and apologize to any pedestrians I come across. Finally, I hate arriving at work sweaty and with my hair mushed flat against my head. While it is true that I can shower at work, that means I need a towel at work, and clean clothes to change into, and I have to get to work earlier to be able to add the shower to my day before I start my job. None of these things is an incentive. I also have some reasons why the Bicycle Transportation Alliance should schedule the Bike to Work Challenge in June instead of September. In September, it is likely to be cold in the morning and hot in the afternoon. 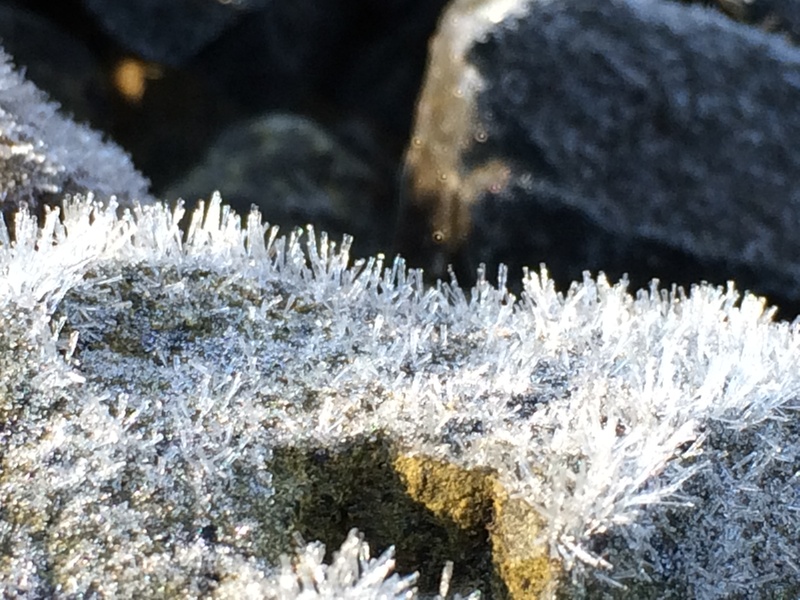 Today, for example, was 52°F in the morning and nearly 80°F in the afternoon. So I wore leggings and long sleeves and a jacket and my full-finger gloves this morning, and this afternoon I wore shorts and a t-shirt and my half-finger gloves and no jacket. Thank goodness I didn’t also need different, more formal clothes for work or I would have had two outfits in my saddlebag in addition to my office shoes. In September, there is a lot more traffic, because of school. More traffic means scarier bicycling. In September, the days are getting shorter quickly, and by the end of the month sunrise will occur after 7 am, which is my ideal time to leave for work. In June, sunrise is consistently before 5:30 am, ensuring safe visibility in the morning. In June, I might start a habit to continue all summer. In September, I probably won’t continue this new habit into the next month because of the cold, dark, and likelihood of rain. OK, thanks for reading my opinions. I don’t know if this link will work for you if you are not on Runkeeper, but here is my route. I’ve started walking seriously again. You may remember that a couple of years ago I walked in the Susan G. Komen 3-Day for the Cure. You may even have donated. I am training for a different event this time, and I am NOT doing any fundraising. This is purely for fun. 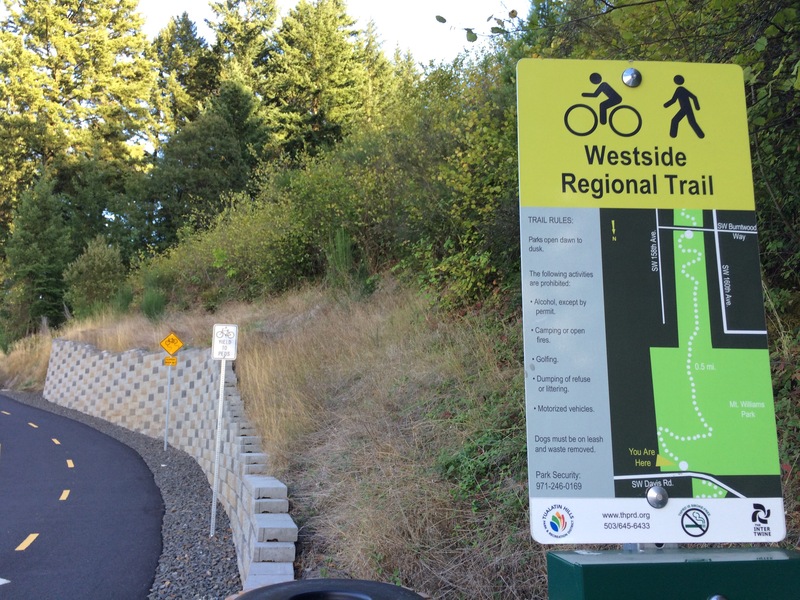 I’ve started training using the long park that runs along the power lines near our house. It is very hilly, and there are plenty of other walkers. Last week I did a “fast” 3 miles at 17 minutes/mile, and today I did a relaxed 4.4 miles at 19 minutes/mile. It has been beautiful and sunny (we are in a drought) and the walking has been lovely. When the hours of daylight increase more, I should be able to walk in the evenings as well as on the weekends. I am looking forward to that. Obviously taking a walk once per weekend is not going to cut it in terms of training. I hope you are keeping warm and cozy, and I hope you get sunny weather soon if you don’t have it right now! At my new job, I found out I am somewhat distantly related to one of my coworkers, who is descended from the Mohawk Brants who settled in Canada after the American Revolutionary War. What a surprise! So conversations with Joe (he even has a family name!) got me to thinking about my ancestors, and I dug through the photos my parents have given me to find some from that side of my family. So here are Joseph Brant Poodry Jr., Joseph Brant Poodry Sr., Joseph Brant Poodry III, and me, in 1972 or possibly 1973. Note that my rebellious dad is the only one not wearing a hat. Kids in the 70’s, geez. Also, great-grandpa is wearing a tie (a bolo tie, but it counts), grandpa’s got the top button undone and has no tie, and my dad looks like he has TWO buttons undone. I obviously think this is hilarious. 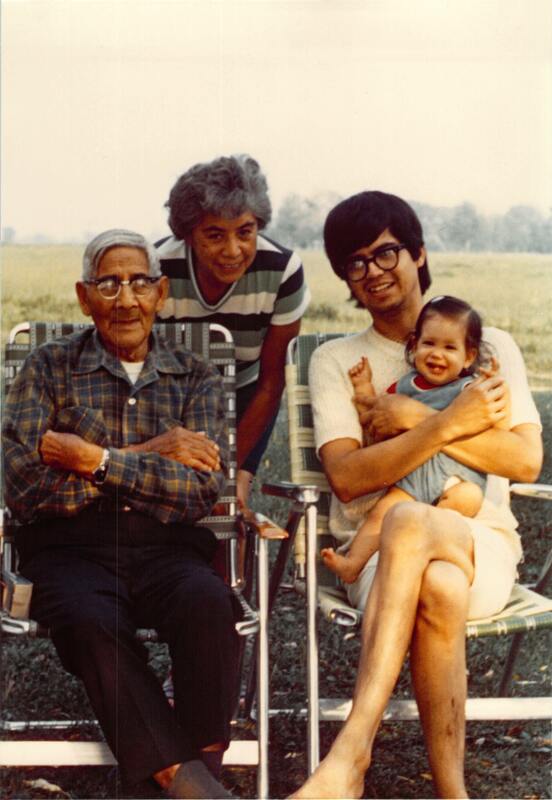 This one is of great-grandpa Wyman Jemison, his daughter Lucille Poodry, Joseph Brant Poodry III, and me, in 1971. I actually sortof remember Grandpa Jemison, in that I recall being at a large meal that he presided over, and I remember being told that he was deaf. Plus, he lived to be 99 years old and died when I was in 5th or 6th grade. I have been told that he said the blessing in the Seneca language, but I don’t remember that. I don’t remember Joseph Brant Senior at all, though obviously I met him. So a little more detail: My grandmother Lucille was turtle clan, and my grandfather Joseph Brant Poodry Jr. was snipe clan. I am directly descended from Mary Jemison, who was a Scots-Irish immigrant whose family settled too far west in Pennsylvania. She was kidnapped from her homestead near Carlisle (later the location of an infamous Indian School) and taken North where she was adopted by a family that had lost a child in war. Mary Jemison had at least three husbands and there is a statue of her near her log cabin in Letchworth State Park by the Genesee river gorge. I am also related to the family of Ely Parker, the subject of the book Warrior in Two Camps by William Armstrong. Parker was a lawyer and engineer, but is noted for his role as secretary to General Ulysses S. Grant. Parker wrote up the surrender papers that ended the US Civil War. Family names indicate I am related to Joseph Brant, who was a Mohawk war chief during the American Revolution. He fought against the colonists (darned illegal immigrants!) and after his side lost he settled in Canada with many Iroquois. Which brings us back to my newly-discovered cousin Joe. Pretty cool. Oh yeah. We are also supposedly related to Red Jacket. Red Jacket was on the opposite side from Joseph Brant. He stayed in the newly formed United States of America and negotiated land in this country. However, in his time he was renowned for giving really good speeches that were so awesome people stayed awake to hear them and didn’t fall asleep listening. 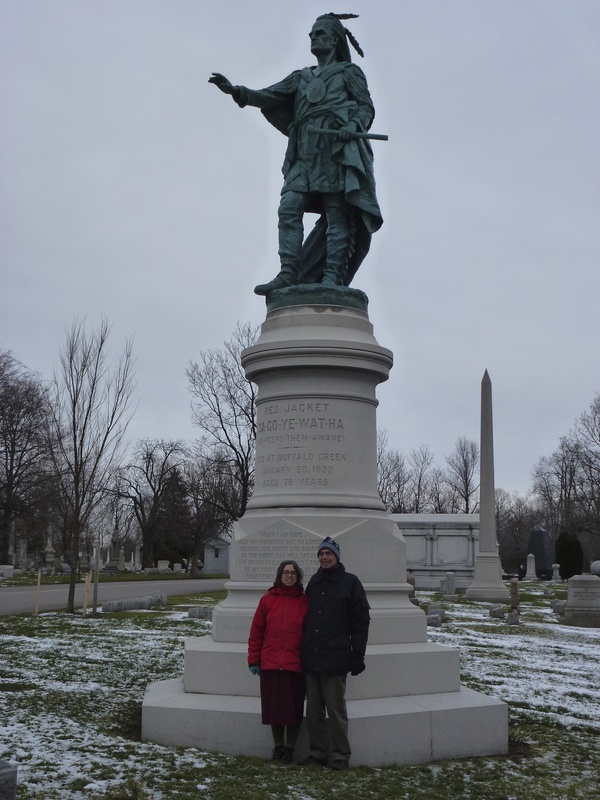 Here is my dad and me at the Red Jacket statue in Forest Lawn cemetery in Buffalo, NY. The oval on his chest is a peace medal, depicting George Washington and Red Jacket shaking hands. Ely Parker is buried right by this statue. When I quit teaching, I thought I would never have another reason to wear my polka-dot pajamas. I don’t wear them to sleep in, because I sweat in them and wake up all clammy. I bought them specifically for Pajama Day, traditionally the Monday of spirit week leading up to Homecoming. I thought I would never have another spirit week again. Well, that is probably true. BUT, I have been delighted that at my new job, we have so far had Employee Appreciation Week (as a teacher we had a teacher appreciation luncheon on one day each year), Octoberfest (no beer, but free lunch with brats and potato salad and sauerkraut and other goodies), a Halloween Costume Contest (departments dress up according to themes, so it was a lot like being in the science department at East), a Pie Party, and today is Pajama Day! 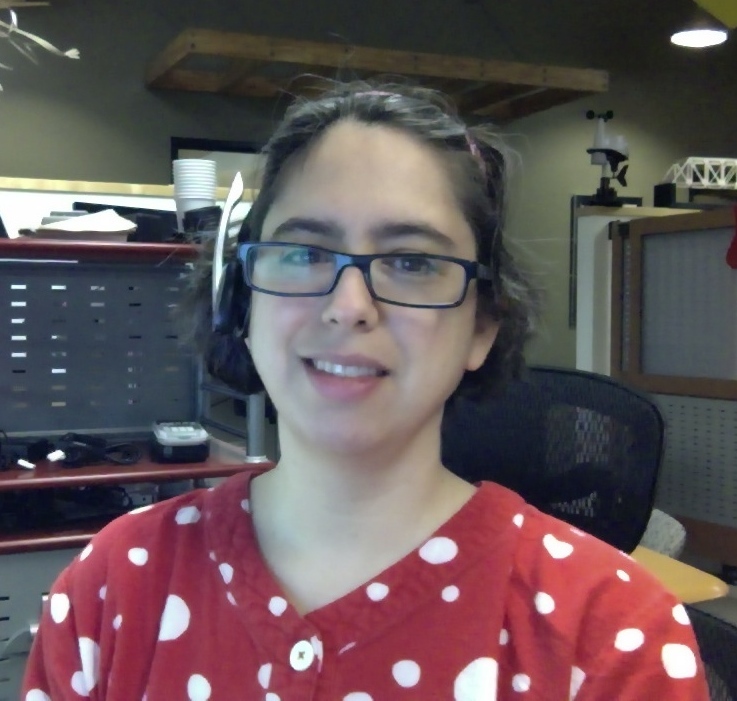 So here I am at work, ready to answer customer calls (even the CEO wears a phone headset most of the time), in my polka-dot pajamas! Of course, there is a downside to wearing one’s comfiest clothing to work. I had to bring extra clothes to work so I could also run errands (which I had to do at school, too). Also, part of the joy of pajamas is not having to put on deodorant and a bra, but since I was coming to work I did that anyway. On the other hand, I also brought my slipper socks to change into once I got to work, which is awesome. And I get lots of compliments on my PJs, also. There have been big changes in my life. I now live in Oregon, having previously lived in Pennsylvania. I am no longer a teacher, by my own choice. I know I stopped blogging for a while, but I hope to start up again. I am happy.